Must be tough finding jobs … Read why at post end. After two weeks of striking, it appears that the red shirts at the Communications Workers of America (CWA) and International Brotherhood of Electrical Workers (IBEW) are heading back to work without a contract in hand. Members of CWA and IBEW at Verizon Communications will return to work on Tuesday, Aug. 23, at which time the contract will be back in force for an indefinite period. We have reached agreement with Verizon on how bargaining will proceed and how it will be restructured. The major issues remain to be discussed, but overall, issues now are focused and narrowed. We appreciate the unity of our members and the support of so many in the greater community. Now we will focus on bargaining fairly and moving forward. CWA and IBEW represent 45,000 workers at Verizon covered by this contract from Virginia to New England. This back to work agreement comes just before the CWA would begin paying up to $300 per week in strike benefits to its striking members, saving the union up to $10 million per week out of its union treasury. 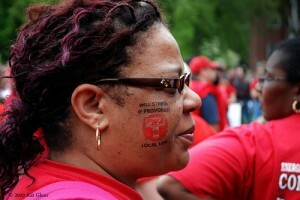 Unions are losing favor with the people, especially strong-arm ones like this. You are currently browsing the archives for the private sector category.